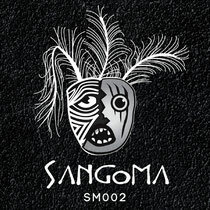 Cambridge’s (UK) Sangoma imprint delivers its second release, ‘Under Attack’, from label boss Nik Frattaroli backed with a remix from Rio Padice. Having been brought up in the Manchester acid house scene of the early-90s, Nik Frattaroli has house music in his blood but while his cuts reference many of the genre’s classic tropes his music is very much a modern interpretation. Frattaroli’s ‘Under Attack’ release comprises three original cuts that strike a balance between punchy, raw grooves and deep, melodic chords and effects. Simplicity and warmth are powerful tools and Frattaroli employs with aplomb across ‘Under Attack’, ‘For Real’ and ‘Clear Blue’. The remix of ‘For Real’ comes from Rio Padice, an artist who has become a must-have for fans of purely analogue driven deep house. Having had underground successes with the likes of Tsuba Limited, Italy’s Padice adds to his form with a loose, immersive and mature interpretation that combines skittering hats, shuffling drums and saturated chords to superb effect.